The rumors about new ipads and ipad mini have come true. After months of rumors, finally Apple has presented its new iPads for the 2019. It has been without keynote and through a press release to the media. The new 10.5 inch iPad Air and the 7.9 inch iPad mini are now available officially on the Apple Store. The two new iPads focuses on renewing their internal components to catch up and offer best possible performance. 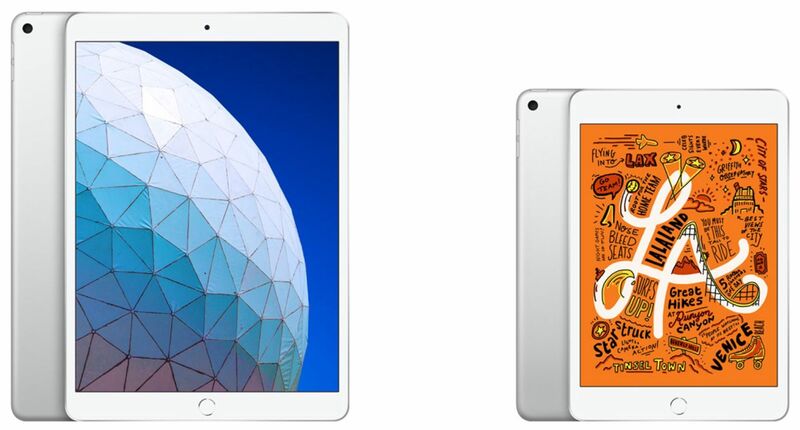 Today, the iPad family is taking two big steps forward with a new 10.5-inch iPad Air, with a size, features and high-end performance at an innovative price, and with a major update to the iPad mini of 7.9 inches, with support for Apple Pencil, with Retina display and the A12 Bionic chip, for the many customers who love its compact size. During the last year Apple updated, annually in spring, its most versatile iPad of all, the iPad of 9.7 inches. It is the size that was originally presented in 2010 and is the new “normal” model. Over the years it has been evolving and it seems that now Apple has decided to increase its screen size, specifications and price of course. The new iPad Air goes to 10.5 inches. The new 10.5-inch iPad Air maintains the frames we already had in the Pro model of the previous generation. Therefore, it also maintains the Touch Id and does not pass to Face ID as it has done with the iPhone and iPad Pro. The exterior design has not been modified, although we do find improvements within the tablet. In the new 10.5-inch iPad Air we find an A12 Bionic processor that, according to the brand, implies 70% more performance and twice the capacity to move graphics. The display panel features True Tone technology. This iPad Air 10.5 inches is compatible with Apple’s Apple Pencil, specifically with the first generation, it seems that you can not use the new model introduced by the iPad Pro last fall. We do not see any changes in the camera or other relevant specifications. It offers two storage sizes i.e. 64 GB and we have another option with 256 GB. As always, it is available in silver, space gray and gold. The 10.5-inch iPad Air prices start at 549 euros for the most basic model. You could say that more than a renewal of the iPad 2018 is a renewal of the iPad Pro 10.5 inches, making it more affordable, although not as much as compare to the iPad 2018. It can be booked from today and will arrive next week. iPad Air 10.5 inches with 64 GB: 549 euros. iPad Air 10.5 inches with 256 GB: 719 euros. iPad Air 10.5 inches with 64 GB and Cellular: 689 euros. iPad Air 10.5 inches with 256 GB and Cellular: 859 euros. We had been waiting for years without any news of the iPad mini and when it seemed that it was dead … Apple has decided to update it. A new version of the iPad mini that maintains its exterior design but puts at par with others with its internal power. This iPad mini is designed to be the most comfortable of all by taking advantage of its lightness and size. Its a perfect iPad for games, to read with Apple Books and to consume content. And really for anything else too, it comes with compatibility for the Apple Pencil. The new iPad mini also features the A12 Bionic chip same as its big brother. This is without a doubt a considerable performance jump, considering that we come from an A8. With a screen as small as the one that comes with 7.9 inches and such a powerful chip, it will have a performance of course at the level of the latest iPhone. According to Apple, it offers three times more performance and nine times more graphics. It has a True Tone panel and according to Apple, has more pixel density than any other iPad given its lower diagonal. The new iPad mini is compatible with the first generation Apple Pencil . The iPad mini is available in the Apple Store for a price of 449 euros. It is available in silver, gold and space gray. Reservations are now open and will begin to reach users next week. iPad Air 10.5 inches with 64 GB: 449 euros. iPad Air 10.5 inches with 256 GB: 619 euros. iPad Air 10.5 inches with 64 GB and Cellular: 589 euros. iPad Air 10.5 inches with 256 GB and Cellular: 759 euros. These are undoubtedly interesting renovations in the iPad range. During the next hours and days we will know more details about these new iPads, so stay tuned to learn more about what the iPad Air and iPad mini of 2019 are capable of and how they are pergorming compare to their previous models.